Description: In this article you will learn the basic operations like Save, Edit, Update and Delete operations in asp.net using LINQ to SQL. Newly inserting record will get displayed in ListBox control and clicking on any record from ListBox will fetch the corresponding details from the database and fills up the appropriate fields on the form, so that we can edit or delete that record as shown in demo above. 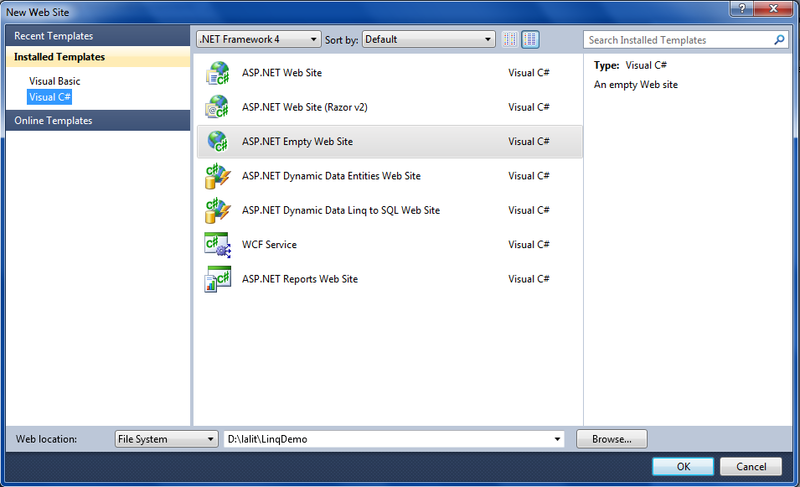 Implementation: Let's create an asp.net application using LINQ to see it in action. 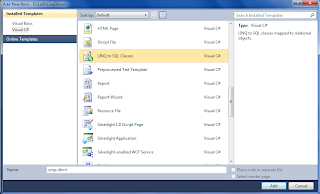 Now open visual studio ->File menu -> New -> Website. 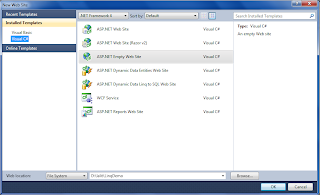 New Web site dialog box will open as shown in image below-> Select Visual C# from the left pane under Installed Templates and also select ASP.NET Empty Web Site ->Select the location to save the application e.g. 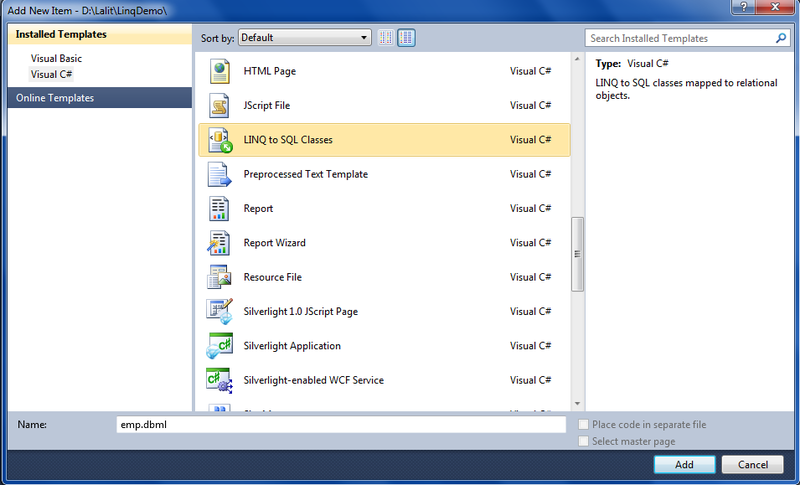 D:\lalit\LinqDemo and click Ok button. Now from the Website menu -> Add New Item ->Select LINQ to SQL Classes-> rename it from the default name DataClasses.dbml to emp.dbml as shown in image below and click on Add button. Just click on Yes button. 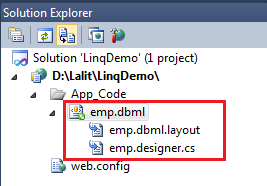 It will add the emp.dbml file in the App_Code folder in the solution explorer as shown in image below. This window is called ORM (Object-relational mapping).This window has two parts. 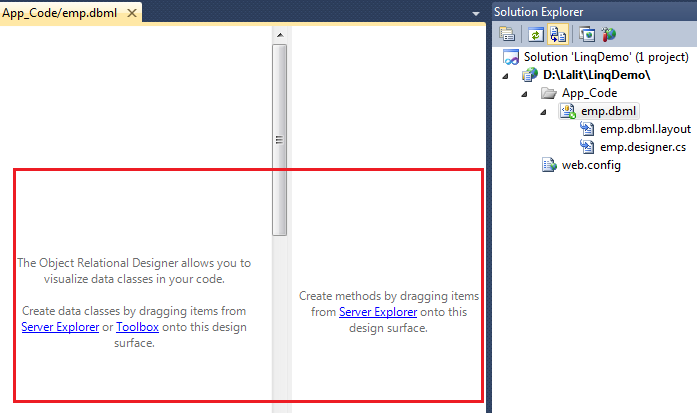 On the Left portion of this window we drag the table from the server explorer and drop here and on Right portion we drag the Function, procedures etc from the server explorer and drop here. Then a dialog box will open as shown in image below. 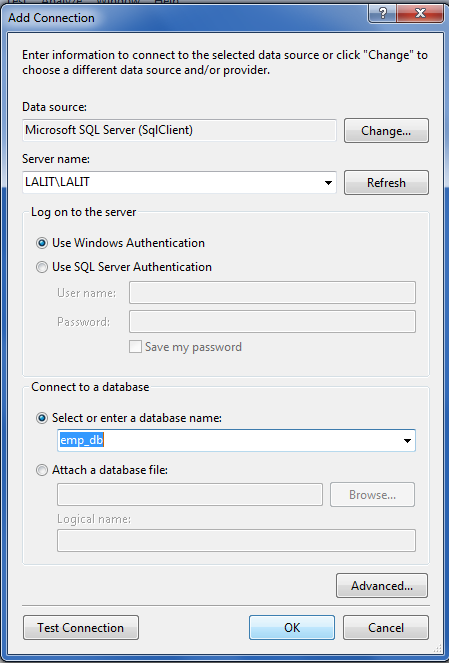 Select your Server Name and database name. Then click Ok button. 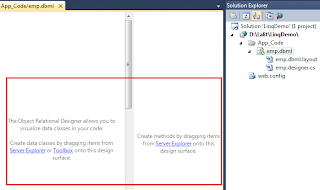 It will add and connect the Sql server database in the Server Explorer of Visual Studio. Now from Server explorer expand your connected database and select and drag and drop the EMP_TABLE to the left portion of the ORM window as shown in image below. It will automatically create the connection string in the web.config file as. <add name="emp_dbConnectionString" connectionString="Data Source=LocalServer;Initial Catalog=emp_db;Integrated Security=True"
Check emp.designer.cs file that is under emp.dbml in solution explorer. Here DataContext class is the main class which internally interacts with the SQL Engine. 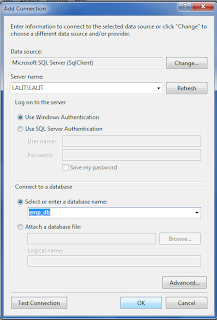 <asp:ListBox ID="lstEmp" runat="server" AutoPostBack="True" Height="131px"
" I hope you have got How to perform the Save, Edit ,Update, Delete and bind functions in asp.net using LINQ to SQL and If you like my work; you can appreciate by leaving your comments, hitting Facebook like button, following on Google+, Twitter, Linked in and Pinterest, stumbling my posts on stumble upon and subscribing for receiving free updates directly to your inbox . Stay tuned and stay connected for more technical updates." hello sir, i question to ask u.have a form to insert and edit it. i already successful to insert it.but when i want to update it using store procedure then the error came out. Hi, what error you are facing in this stored procedure..